In 1967 the aircraft manufacturer North American Aviation amalgamated with the engineering company Rockwell Standard to form North American Rockwell Corp. In 1973 the company was renamed Rockwell International. Rockwell's Autonetics division was a leading developer of integrated circuits, especially for defence systems, and from it was formed North-American Rockwell Microelectronics Corporation (NRMEC). In the late 1960s Autonetics diversified into calculator integrated circuits and was a pioneer in manufacturing LSI MOS calculator ICs, used in early Sharp Calculators. The page on the Sharp QT-8D tells more of this story. American Micro-systems Inc., another semiconductor manufacturer, had moved into manufacturing and marketing complete calculators under the trade name Unicom (see photograph below). This company was bought by Rockwell in 1972 as part of its diversification programme. 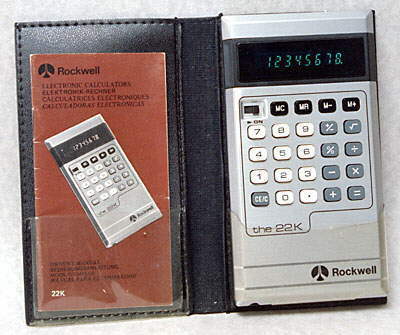 Initially, calculators continued to be sold under the Unicom name, but this was soon changed to the Rockwell name. In 1973 Rockwell bought out the Sumlock-Anita company, the largest British calculator manufacturer, to which it had been supplying calculator integrated circuits. 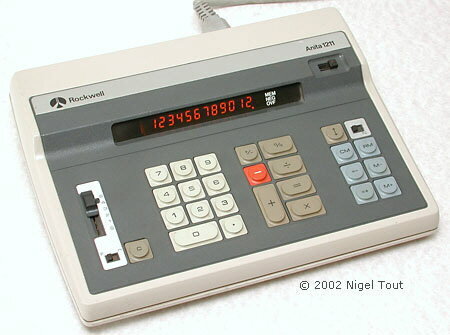 Manufacture of ANITA calculators, also with Rockwell branding, continued at the Sumlock-Anita factory in Portsmouth, in southern England, where some of the Rockwell hand-held calculators were also manufactured. Rockwell also had a consumer electronics subsidiary called Lloyd's Electronics which sold a wide range of models of its Accumatic calculators. A few of these were manufactured by Rockwell though most were sourced from Asia. In mid-1972 Rockwell started to ship LCD (Liquid Crystal Display) calculators to Lloyds, Sears Roebuck and Rapid Data, which were sold under their names. These were the first successful use of LCDs in calculators - See the Lloyd's Accumatic 100 and the Rapid Data Rapidman LC1208. Many Rockwell hand-held calculators share a very distinctive casing design, as in the 8R below. These models were very successful and are common. The earlier models were mainly assembled in Mexico, though there was some assembly in England, but later models originate from Hong Kong and Japan. Rockwell also manufactured some desktop models, but these are not very common. In November 1976, the journal Business Week reported "Over the past five years , Rockwell's calculator sales went from zero to $130 million a year. But the company has lost money due to industry price cutting. Japanese competitors are making deep inroads now. Says Al Rockwell: "If they [Japan] come along and say 'We can sell you a calculator for half of what you can make it for', we ought to take a look at that." Rockwell hopes that the lower prices today are merely an "aberration". However, the company has closed two of its three calculator plants, fired half of its 2,000 workers, and claims it is now in fighting trim." Around 1977, during the great slump in calculator prices, Rockwell completely quit consumer electronics, including calculator manufacture, to concentrate on its core aviation, military, and industrial business, including the Space Shuttle. Calculator made by American Micro-systems Inc. under the name Unicom. The company was bought by Rockwell in 1972. Unicom models were gradually phased out in favour of Rockwell models. 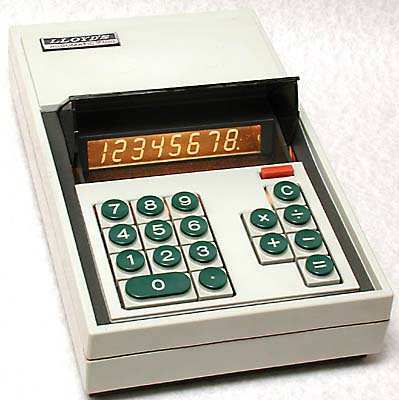 A very common calculator, together with the 18R, of the mid-1970s. One of a range of classy, slim, wallet-style Rockwell calculators, from the mid-1970s, manufactured in Asia. Programmable, printing calculator, storing programs on magnetic cards. Assembled in Mexico it dates from the mid 1970s. This is similar to the Unicom 201. On the label it says "Rockwell International. Sumlock Anita Ltd, Uxbridge, England. Assembled in Mexico Primarily of United States components." Rockwell bought the British calculator manufacturer Sumlock-Anita in 1973. There is more information about Sumlock-Anita and the world's first desktop electronic calcultors in the Calculator Companies section of this site. 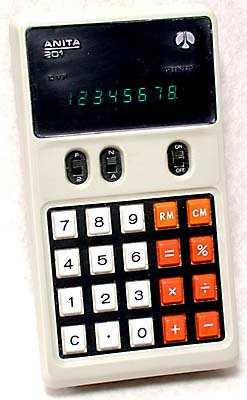 One of a range of desktop calculators made in England in the mid-1970s after Rockwell bought out Sumlock-Anita. 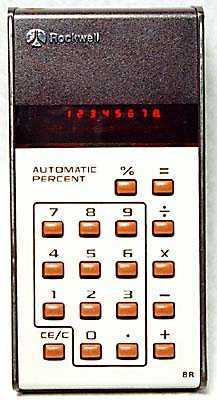 Launched in 1972 by this Rockwell subsidiary, this model was one of the first LCD (Liquid Crystal Display) calculators. Assembled in Mexico by Rockwell. Rockwell hand-held calculators see the Calculator Photo Library on this site. ANITA hand-held calculators see the Calculator Photo Library. Unicom and-held calculators see the Calculator Photo Library. "Rockwell walks a rough road to profits", Business Week, November 3 1975, p92.